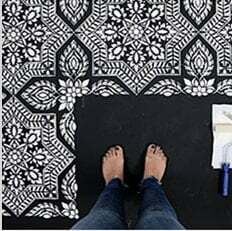 This stencil works with our Paint-A-Pillow kits. It attaches to our stenciling frame (pat. pend) which allows you to stencil your accent pillow without the need for tape. Perfect if you own a Paint-A-Pillow kit and want to expand your pillow making possibilities! Our pillow stencils are precision cut from 12 mil clear plastic material. They are durable, completely reusable and easy to clean. Our stenciling kits allow you to create your own custom designer accent pillows. Bring a world of color and pattern to any space in your home. Our innovative stenciling system makes it fast, fun and incredibly easy to create a personalized pillow masterpiece that you can be proud of! An accent pillow can do wonders for your room, whether you're looking to just bring in a pop of color and pattern or give your space a completely fresh designer look. Most interior designers consider toss pillows to be on of the most powerful decorating accessories, capable of changing the look of the entire room. Give your living room or bedroom a quick, chic and vibrant makeover with eye-catching DIY designer throw pillows! These decorative accent pillows will look fabulous on any sofa or bed. when heat-set. Buy full set and save! stenciling! Dries soft, completely safe to wash/dry clean when heat-set. Permanent fabric markers, great for accent pillow embellishment! Pack of 12. Suede tassels - 4-pack tassel set. Two colors per pack. Perfect for accent pillow embellishing! 2" Designer tassels - 4 pack. Perfect for accent pillows! Mini silk flowers, pack of 6. Prefect for accent pillow accessorizing! Attach to fabric with Fabric Fusion Glue (sold separately). Large crystal rhinestones for accent pillow embellishment. Pack of 9. Self-adhesive eyes for accent pillow accessorizing. Pack of 137 pc. per pack. Great for accent pillow embellishment! Metal studs, round shape, antique silver, pack of 150. Assorted. Great for accent pillow embellishment! Our Paint-A-Pillow Stencil Frame works with our Paint-A-Pillow system. Great tool for no-sew tassel installation! Pillow Insert, 17" x 17"